The Scuola Grande di San Teodoro is part of a very old tradition. 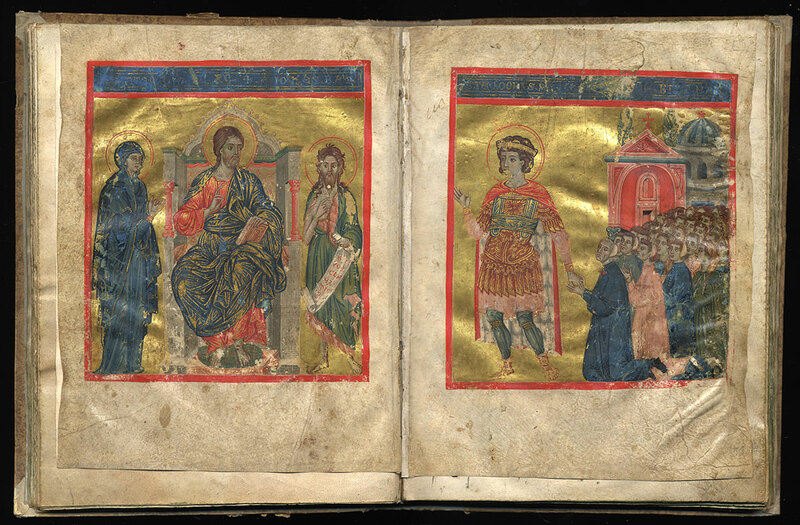 In the eighth century, in a small church, where the Basilica of San Marco is located today, a brotherhood was founded and dedicated to the saint who became the city patron. In 828, the Serenissima Republic, following the policy of detachment from the Byzantine sphere of influence, to St. Theodor, replaced St. Theodor with St. Mark, whose body was brought to Venice from Alexandria, Egypt, that year. As a result, our brotherhood was dissolved. The reconstruction of the association at the Augustinian fathers of San Salvador dates to the 1st March 1258. The fathers, in fact, granted a small room to be used as a seat for meetings, five burials in the cloister and an altar in the church consecrated to the saint. In exchange the brothers paid three ducats a year to the convent. The sources prove that in 1261 the remains of San Teodoro were moved to Venice from Constantinople. These relics were, with great solemnity, placed in an urn on the altar of the Scuola in the church of San Salvador. The brothers committed themselves to decorate and illuminate the chapel dedicated to their protector. The activities of the School were gradually becoming more and more characterized by particular attention and propensity to the poor’s welfare. Due to this specificity, over the years, the number of members, some of whom were very influential, increased to such an extent that the confraternity acquired a new status in the city. 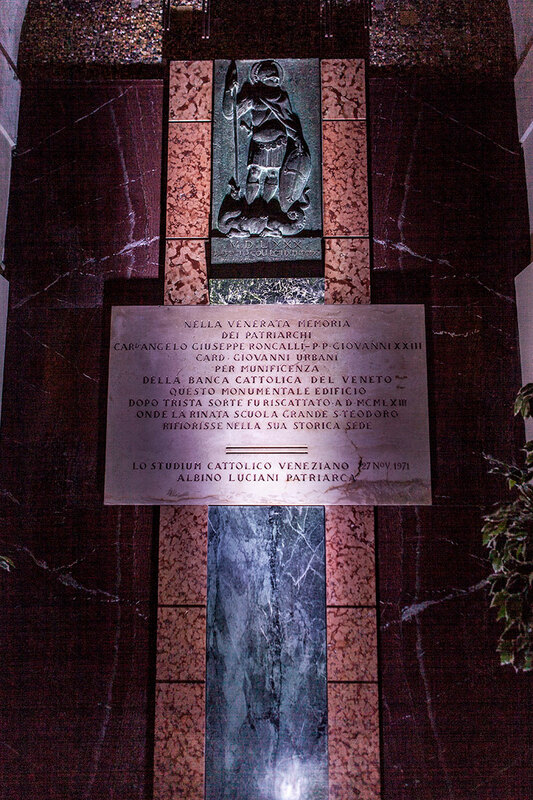 Its prestige increased in 1434, when Pope Eugene IV granted seven years of indulgence to those who would pray at the altar of San Teodoro, and even more so, when, in 1448, another Pope, Nicholas V, confirmed the indulgence for those who visited the chapel on 6th August, the day of the S.S. Salvatore, and on 9th November, the day of San Teodoro. Two years later, on 12th October 1450, the Senate recognized San Teodoro as the patron saint of Venice again, together with San Marco, decreeing a day of obligation on the day of his anniversary. In 1552 the Scuola was raised to the dignity of the “Grande”. The majority of the brothers were merchants and artisans, and the composition of the members remained unaltered throughout the long course of its history. Originally, the charitable activities of the Scuola consisted in offering the soup to the poor on holidays, and the brothers themselves were responsible for preparing the food. In the early sixteenth century, in the church of San Salvador, the Augustinian Fathers were succeeded by the Canonici Regolari who decided to enlarge and modify their church. The project, attributed to Jacopo Sansovino, involved the expansion towards the “campo” and the demolition of the altar of the Scuola. At the time, the body of the saint was kept in the sacristy. That arrangement should have been temporary yet, once the work was finished, the fathers refused to return the altar and the body of the saint into the church. After a lengthy dispute, in 1574, the official redelivery of the church altar and the venerated relic eventually took place. 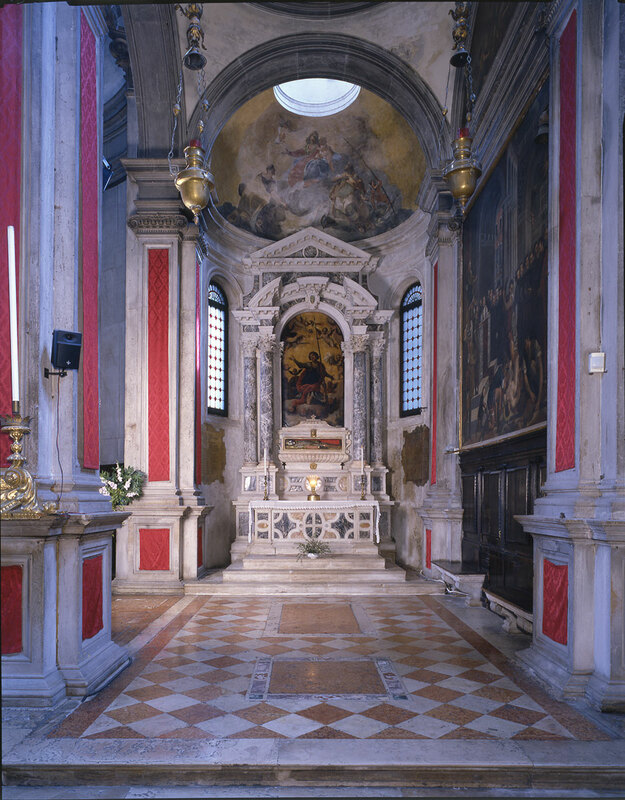 However, it was not the current altar (to the right of the main altar), but the one on the left owned by the Gritti family. Following constant quarrels about the headquarters and the altar with the fathers of San Salvador, the brothers decided to build a new building, entirely owned by the Scuola, where they could gather and perform charitable acts for the poor. The money for the purchase of land and construction was contributed by the subsidiaries, and the first stone was laid in 1580. The headquarters built on a project by Simone Sorella and measuring about 7 x l4 m, were smaller and oriented differently from the current one - the façade was not in the “campo” but on the canal. At the end of 1581, the building was completed, and according to sources, for the feast of San Teodoro, on 9th of November, illustrious representatives of other Scuole Grandi were hosted there. From this date (1580), two bas-reliefs depicting Saint Theodore killing the dragon can still be seen today in the corner facing the canal. Created by Battista Tagliapietra, they are engraved with the name of Giuseppe Negroni, then "Guardian Grando" of the Scuola. The size of the new headquarters, however, did not respond to the demands of social prestige, dictated by the importance which the Scuola acquired over the years. Consequently, the brothers soon began to raise funds to enlarge and embellish it. By gradually buying houses and shops in the immediate vicinity of the headquarters, in 1608, the enlargement project could start. It was presented by Tommaso Contin, an architect of Swiss origin but a Venetian by adoption, named "Proto alla Fabrica". His project was unfortunately lost. According to the sources, to achieve the work Contin had to demolish seven houses and various shops. Although the architect had planned to demolish all the shops purchased by the School in "calle del Lovo", the brothers rejected the idea, so as not to renounce the good income from the rent. As a result, it was decided that the ground floor hall would be smaller than the one on the first floor. By inverting the axis of the previous building which now had the monumental façade facing the “campo”, the project completely changed the appearance of the building. The income of the Scuola, however substantial, was not sufficient to cover the vast expenses for the construction of the new building. Therefore, the School had to resort to the help of the Scuola di San Rocco with a loan of 4000 ducats, an amount returned only many years later, in 1635. Despite the loan and the efforts of the brothers, the façades with the significant sculptures and the staircase to access from the ground to the first floor were still missing. In 1649, a wealthy brother and merchant Giacomo Galli died, and left a considerable sum to the confraternity to complete the work. As a result, they appointed architect Antonio Sardi, who was alongside Contin one of the Ticino architects working in Venice at the time. In carrying out the work, the architect was assisted by Baldassarre Longhena and Sardi’s son, Giuseppe. 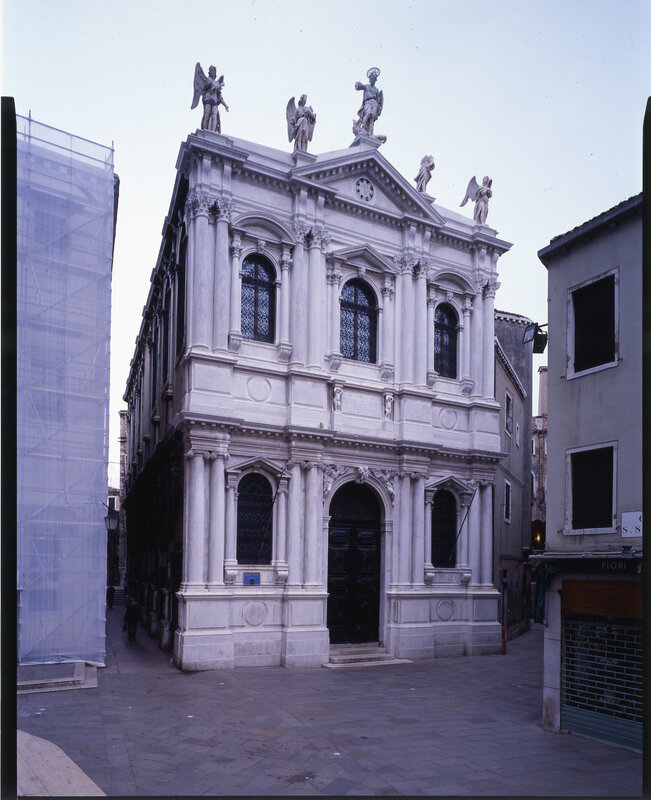 The complex of the façades, while remaining substantially tied to sixteenth- century schemes, belongs to the new baroque taste that Baldassarre Longhena was spreading to Venice at the time, and organically links with the rear façade of the church of San Salvador, also built on a project by A. Sardi. The sculptures, in Vicenza stone, and the crowning elements of the main façade were created by Bernardo Falconi in 1657. The imposing staircase, built in 1661, which connects the ground floor hall with the chapter hall on the first floor, is also to be ascribed to Sardi. When Antonio Sardi died, his son Giuseppe designed a magnificent entrance door to the chapter hall. Today there are two splendid bas-reliefs depicting San Marco and San Teodoro, by Carlo Mazzocchi. Baldassarre Longhena directed the execution of the façade towards "calle del Lovo", the work that he completed by managing to harmonize the last façade with the others, already built before. In 1692, the interventions in the construction of a building that is still among the most significant in terms of type and refinement can be considered completed. The life of the Scuola was marked by assistance activities, meetings, religious services, and not the least by participation in the most important of the many processions that were held in Venice during the Venetian Republic. The participation in the processions, obligatory for all the brothers, involved huge expenses that were equally shared among the main representatives of the governing body. On these occasions many valuable objects were exhibited, part of the brotherhood's treasure, which, according to the silver inventory compiled in 1787, included a number of precious objects for a total weight equivalent to 7568 ounces (214,55 kg). The Scuola participated in the processions with the brothers dressed in white hoods with lit candles, sometimes finely illuminated, preceded by five players and four singers. The Guardian Grando, the Vicar, the twelve Bancali, would paraded followed by a large number of brothers; the former wore a cream-colored dress with the sleeves "alla ducale", the vicar wore a red tunic, while all the others wore a white tunic with, embroidered on the arm, the symbol of the Scuola. The most striking attraction was the two "soleri", silver chariots, one built according to a design by Jacopo Sansovino, bearing a statue of San Teodoro with the dragon, the other designed by G. Carlo Zucchi, with a relic of Santa Sabina. These wagons had the function of summoning many people, stimulating their imagination. In 1537 the confraternity set up two other chariots that, on the eve of the feast of San Teodoro, traveled along "le calli" from San Marco to Rialto with trumpets and pipes to draw people's attention to the religious function that would be celebrated the following day in the church of San Salvador. Sometimes even living chariots were made with a brother dressed in San Teodoro with a dragon and a boy dressed as an angel. In the processions, the poor benefited by the brothers paraded alongside their benefactors.La partecipazione alle processioni, obbligatoria per tutti i confratelli, comportava spese ingenti che venivano equamente ripartite tra i principali esponenti del governo del sodalizio. In queste occasioni venivano esibiti molti oggetti di valore, facenti parte del tesoro della confraternita, che, secondo l’inventario degli argenti redatto nel 1787, comprendeva una quantità di oggetti preziosi per un peso complessivo equivalente a 7568 once (214,55 Kg.). La Scuola partecipava alle processioni con i confratelli vestiti in cappe bianche con candelotti accesi, a volte finemente miniati, preceduti da cinque suonatori e quattro cantori. Sfilavano il Guardian Grando, il Vicario, i dodici Bancali, seguiti dal folto numero dei confratelli; il primo portava un abito color crema con le maniche alla ducale, il vicario indossava una tunica rossa, mentre tutti gli altri avevano la tunica bianca con, ricamato sul braccio, il simbolo della Scuola. L’attrazione di maggiore spicco era costituita dai due soleri, carri d’argento, l’uno costruito su disegno di Jacopo Sansovino recante una statua raffigurante San Teodoro con il drago, l’altro su disegno di G. Carlo Zucchi, con una reliquia di Santa Sabina. Tali carri avevano la funzione di chiamare a raccolta molta gente, stimolandone la fantasia. Dal 1537 la confraternita stabilì di istituire altri due carri che, alla vigilia della festa di San Teodoro, percorressero le calli da San Marco a Rialto con trombe e pifferi per richiamare l’attenzione della gente sulla funzione religiosa che si sarebbe celebrata il giorno seguente nella chiesa di San Salvador. 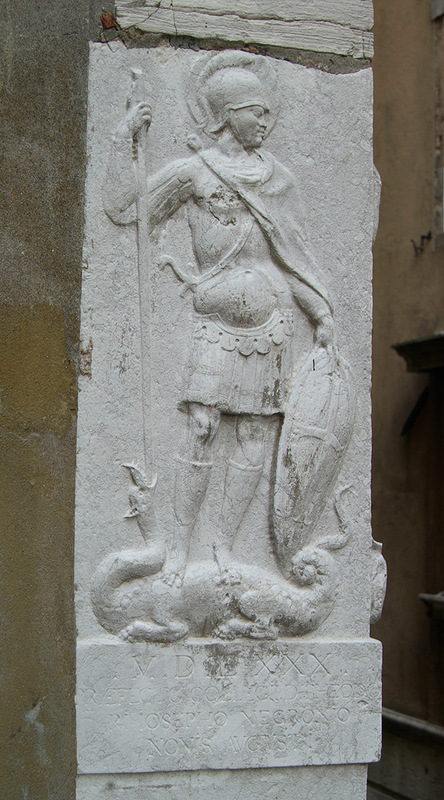 Alcune volte si fecero pure carri viventi con un confratello vestito da San Teodoro con il drago e un fanciullo vestito da angelo. Nelle processioni i poveri beneficiati dai confratelli sfilavano accanto ai loro benefattori. The confraternity reached the threshold of the nineteenth century still rich, active and operating in the social fabric of the city. Unfortunately, the well-known events related to the fall of the Serenissima Republic did not spare this praiseworthy institution that saw in those sad days its suppression and almost all the magnificent silver furnishings, which were the work of refined craftsmen, fused to the Milan mint by order of the Napoleonic government. 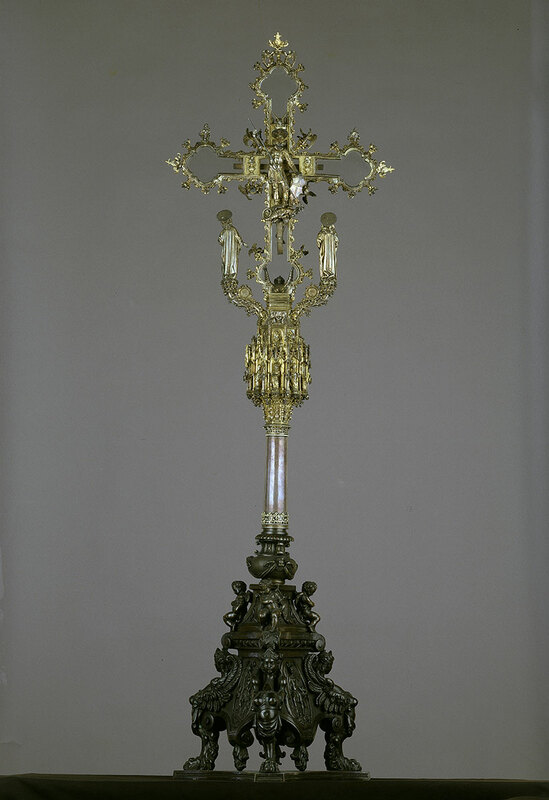 The precious silver cross and rock crystal (fifteenth century) that appears at the Gallerie dell'Accademia and a few other objects remain a testimony of this splendour. Paintings, sculptures, altars, and furnishings are partly lost, partly dispersed and/or recently identified in various collections. The headquarters were used as a place for political meetings, then a storage of flour, then a shelter for beggars, then a political archive. From 1821 until 1837, the headquarters were leased to a bookseller and then to an antique dealer. Around 1840, the property was sold to a Venetian nobleman, then it was rented as a furniture store on the first floor and as a cinema on the ground floor.Purtroppo i noti eventi legati alla caduta della Serenissima Repubblica non risparmiarono questa benemerita istituzione che vide in quei tristi giorni la sua soppressione e quasi tutti i magnifici arredi d’argento, che erano opera di raffinati artigiani, fusi alla zecca di Milano per ordine del governo napoleonico. A testimonianza di tanto splendore rimane la preziosa croce astile d’ argento e cristallo di rocca (XV secolo) che figura presso le Gallerie dell’Accademia e pochi altri oggetti. Dipinti, sculture, altari ed arredi sono in parte perduti, in parte dispersi e/o recentemente identificati in collezioni varie. La sede fu adibita a luogo di riunioni politiche, poi a deposito di farine, quindi a ricovero per mendicanti, poi ad archivio politico. Dal 1821 fino al 1837 la sede fu data in affitto ad un libraio e successivamente ad un antiquario. Intorno al 1840 l’immobile fu dal demanio venduto ad un nobile veneziano, fu poi dato in affitto come negozio/deposito di mobili al primo piano e come cinema al pianterreno. In 1960, thanks to the intervention of the Patriarch Card. Giovanni Urbani and the prof. Eugenio Bacchion the Scuola di San Teodoro could be reconstituted; composed, as originally, predominantly by traders, artisans, and professionals born or residing in Venice.